Investing The Right Way, For The Right Reasons. The Biggest Problem for Most Investors is Finding a Reliable, Repeatable, Proven System. 1. What investment should I buy? 2. When should I buy? 3. And when should I sell? in my free “Bulletproof Investor” Master Class. Whether you’re brand new to investing, or you have many years of experience, and especially if you’re a professional money manager…I’m going to teach you how to consistently win on Wall Street, in a proven and systematic way that minimizes risk and maximizes gains. 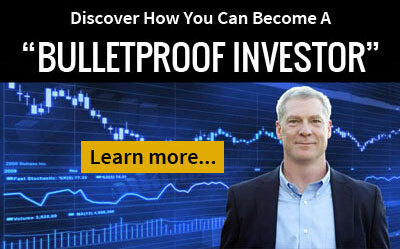 You’ll become a “Bulletproof Investor”, and it won’t feel like you’re gambling. In fact, you’ll see the stock market as a totally new place, where opportunity abounds and risk is almost non-existent, letting you sleep like a hibernating bear in the dead of winter. I’m going to show you exactly how to do this, even if you are somewhat afraid, don’t have a lot of time or money, believe the stock market is risky, and especially if you’re someone who cringes every time you open your 401K statement or hear the latest market update on the nightly news. there’s a very good chance you’ll get the results. • This is NOT a “get rich quick” system. • It’s not a “get paid to do nothing” program. • This is not like any investing program on the market today. • My results are NOT typical. In fact, they aren’t even remotely typical. • And I will be mentioning God and the Bible throughout the program. for this free master class – click here.